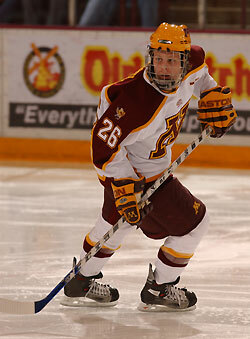 This past weekend, the Gopher hockey team swept the former #1 Wisconsin Badgers at Madison. Now, first let me say that I make no attempt to hide the fact that I'm a Gopher fan. But all biases aside, I was amazed by the reaction of the Badgers fans towards Madison-born phenom Phil Kessel. Every time Kessel touched the puck, Bucky-backers let him hear it with a chorus of boos. Keep in mind, this is an 18-year-old kid who was raised a mere 10 minutes from the University of Wisconsin's Madison campus. I usually hate this kind of fan reaction whether it be Knobluach returning to Minnesota with the Yankees, Bertuzzi and inexplicably bitter Wild fans, the list goes on and on. But what makes this all the more ridiculous is that this is the first year that I can remember where there hasn't been more Minnesotans than Wisconsinites playing for the cardinal and white! So is it just the sheer caliber of player? True, some have Kessel going as high as the #1 overall pick in this summer's NHL entry draft. But i would counter that Zach Parise was a phenomenal player who was born and raised in Minnesota but went to the University of North Dakota. Yet I can't remember a Gopher home game where Parise was booed. I guess one possible explanation is simply that Minnesotans are used to producing so much young hockey talent that I would wager that most Division I schools have at least one Minnesotan on their roster. Actually trying to boo every Minnesotan playing for another team would just be impossible. I could sit here for hours thinking of excellent Minnesota players who didn't play for the maroon and gold. I suppose another reason could be that there are a total of 5 in-state Division I hockey schools so maybe we're just used to competing against fellow Minnesotans. And on the other hand, Fighting Sioux fans certainly had their opportunity to boo native North Dakotan Gophers like Grant Potulny, Ryan Potulny, and Danny Irmen (and my memory could be a little spotty here) but I don't recall ever hearing it when we played up there. I may have heard a jab here or there when Grant Potulny got the game-winning OT goal in the national championship game in 2002, but that's about it. The highlight of the weekend came in the third period of the Saturday night finale when Kessel quieted the crowd with a superb wrist-shot goal.